Ceoltóir agus aisteoir Meiriceánach ab ea Elvis Aaron Presley (8 Eanáir, 1935 – 16 Lúnasa, 1977). Íocón cultúrtha mór le rá a bhí ann, siamsóir ar ar tugtar an leasainm The King (an Rí), nó The King of Rock-n-Roll (Rí an Rac-Cheoil) mar bhí sé ar duine de na ceoltóirí a chuir rac-cheol i láthair do lucht éisteachta mór den chéad uair. Rugadh Elvis Presley i dTupelo Thoir, Mississippi ar an 8 Eanáir, 1935. Bhí a thuismitheoirí Vernon Elvis Presley agus Gladys Love Smith ag súil le leathchúpla, ach bhí marbh-bheirthe ann (buachaill eile a bhí ann, ar ar thug siad Jesse). D´fhás Presley aníos i dTupelo Thoir ar dtús, agus ansin chuaigh an teaghlach go dtí Memphis, Tennessee sa bhliain 1948. An bhliain ina dhiaidh sin, bhog siad isteach i Lauderdale Courts, eastát tithíochta a bhí suite gar do háiteanna ceoil ar nós Beale Street, Ellis Auditorium agus Sun Studios. Thosaigh Presley ag seinm an ghiotáir ag an am sin, ina aonar ar dtús agus ansin le daoine eile as a chomharsanacht. Tar éis na scoile, d'oibrigh sé leis an Precision Tool Company, agus ansin thiomáin sé trucail don Crown Electric Company. I rith an tsamhraidh 1953, chuaigh Presley go dtí Sun Studios agus chaith sé ceithre dhollar chun dhá amhrán a thaifead - My Happiness agus That's When Your Heartaches Begin. Ba bhailéid coitianta ag an am sin iad, agus thug Presley an ceirnín dá mháthair mar bhronntanas lá breithe. D'éist bunaitheoir Sun Records Sam Phillips leis na rianta freisin, agus thug sé cuireadh do Phresley teacht isteach arís i mí Meitheamh 1954 chun cúpla amhrán a chanadh. I mí Iúil, thosaigh siad ag obair sa stiúideo leis na ceoltóirí áitiúla Scotty Moore agus Bill Black. 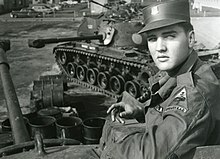 Ar an 5 Iúil 1954, thosaigh Presley ag canadh an amhráin That's All Right i rith sos sa stiúideo. Chan sé an rian ina stíl nua féin, agus cheap Phillips go raibh rud nua speisialta acu. Sheol sé amach é mar shingil, le Blue Moon of Kentucky ar an taobh eile. Thosaigh an stáisiún raidió WHBQ ag casadh an singil, agus i gceann tamaill bhain siad rath amach leis. Thosaigh Presley ag seinm ar fud na háite, agus d'fhás a cháil ó Tennessee go dtí áiteanna eile freisin. Sheinn Presley ag an Grand Ole Opry i Nashville freisin, áit atá tábhachtach fós. Lean sé ar aghaidh ar thuras sa Deisceart Mheiriceá. Ar an 16 Deireadh Fómhair 1954, sheinn sé ar an Louisiana Hayride, craoladh ceol-tíre i Shreveport, Louisiana. Rath mór ab ea é, agus fuair sé conradh nua chun píosa a dhéanamh gach seachtain. Ag an am céanna, bhuail sé le Colonel Tom Parker. Ar an 15 Lúnasa 1955, shínigh Presley conradh le Hank Snow Attractions, comhlacht a bhí ag an amhránaí Hank Snow agus Colonel Tom Parker. Fuair Parker margadh leis an gcomhlacht mór RCA Records ar an 21 Samhain 1955, agus d'oscail siad dhá chomhlacht i Nua Eabhrac chun ceol Presley a fhoilsiú. Ba bhainisteoir cliste é Parker, agus d'úsáid sé ainm Presley chun a lán airgid a dhéanamh. Níos déanaí, rinne Parker margadh le Hollywood Studios, agus rinne scannáin Presley a lán airgid freisin. Ar an 20 Nollaig 1957, fuair Presley amach go raibh dhá bhliain le déanamh aige san airm, agus chuaigh sé isteach san airm an 24 Márta 1958. Bhí a lán spéis poiblí, ach ní bhfuair Presley aon cóir fhabhrach. Fuair sé moladh freisin, mar ní dhearna sé gearán faoi, agus níor úsáid sé a cháil agus a airgead chun cóir níos éasca a fháil. Seoladh Presley go dtí na Gearmáine ar an USS General George M. Randall (AP-115), mar gnáth-shaighdiúir. D'fhill sé abhaile an 2 Márta, 1960. Nuair a bhí sé ar ais, cheap a lán daoine (mar shampla John Lennon) gur chaill Presley rud éigin san airm, agus bhí a shaothar nua níos measa. Bhí fearg ar Phresley féin leis a shlí bheatha, agus an obair deacair a bhí le déanamh aige leis na scannáin. Ní raibh mórán ama aige chun ceol nua agus suimiúil a chruthú. Sa bhliain 1960, sheol sé amach an t-albam Elvis is Back. Bhí roinnt rath ag an albam, ach i bhfad níos lú ná a cheirníní níos luaithe. Ba thréimhse athraitheach iad na 1960idí, agus bhí sé deacair dó a áit a fháil amach arís. Bhí an tIonradh Briotanach faoi lán seoil, leis The Beatles agus na bannaí nua eile. Ar 1 Bealtaine 1967, phós Elvis Presley Priscilla Beaulieu i Las Vegas. Tháinig Presley ar ais go fírinneach leis an '68 Comeback Special. Craoladh an taispeántas ar NBC ar an 3 Nollaig 1968, agus bhí sé an-rathúil. Chuaigh Presley ar ais go dtí a fhréamhacha rac-cheoil; sheinn sé an ghiotár agus chan sé a amhráin chomh láidir is a rinne sé riamh. Fuair sé fuinneamh nua, agus chuaigh sé amach ar chamchuairt arís sa bhliain 1969. Tar éis seacht mbliana gan singil ag barr na gcairteacha, chuaigh a amhrán Suspicious Minds go dtí uimhir 1 ar an 1 Samhain, 1969, an t-amhrán deireanach uaidh a shroich an áit seo i rith a shaoil. Bhí rath mór aige fós i dtíortha eile, agus bhí na hamhráin Burning Love an-rathúil i Meán Fómhair 1972, agus The Wonder Of You sa bhliain 1970. B'ócáid mhór é an ceolchoirm Aloha from Hawaii, a craoladh i mí Eanáir 1973, an chéad chéad clár a chraoladh ar fud an domhain le satailít. Idir 1969 agus 1977, rinne Presley níos mó ná míle ceolchoirm, i Las Vegas agus ar thuras. B'é an chéad ceoltóir a bhí ábalta ceithre ceolchoirme i ndiaidh a chéile a dhíol amach i Madison Square Garden, Nua Eabhrac. I rith na 1970idí, thosaigh sláinte Presley ag éirí go dona. Bhí andúileach aige ar drugaí oideas, agus bhí drochthionchar acu ar a chorp agus a intinn. Bhí a cheolchoirm deireanach aige i Indianapolis, Indiana ar 26 Meitheamh, 1977. Ar an 16 Lúnasa 1977, frítheadh corp Phresley ina mhainteach Graceland. Bhí sé sa mbaile leis a fiancé Ginger Alden, nuair a fuair sé bás sa seomra folctha. Tógadh é go dtí an Baptist Memorial Hospital, ach fógraíodh a bháis ag 3.30 sa tráthnóna. Dúirt na dochtúirí gurb é taom croí a bhí i gceist. Bhí a lán plé faoi chúis a bháis, ach ní bheidh torthaí an scrúdú iarbháis amach sa phobal go dtí 2027. 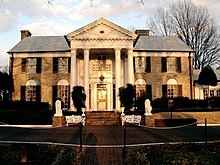 Cuireadh é ar dtús i reilig Forest Hill i Memphis in aice leis a mháthair, ach ath-chuireadh an bheirt i Graceland tar éis iarracht gadaíochta. ↑ Reaves, Jessica (15/8/2002). ""Person of the Week: Elvis Presley"". Time Magazine. Tugadh an leathanach seo cothrom le dáta an 15 Lúnasa 2017 ag 20:53.